This blog entry is more of a personal reminder - and now it's somewhere on the internet in theory it shouldn't ever disappear. I do a lot of PHP related coding in my day-to-day. Be it website projects all the way through to browser-based applications, both professionally and personally - I think I've hit a point where VS Code - my editor of choice, is finally covering almost all my use cases. This year, started on a Monday, and coincidentally, I started a new experiment to stay organised and keep track of my day-to-day happenings. It's called a Bullet Journal, and it's a method of keeping a concise, goal/task-driven journal of daily happenings. It's very free-form in nature, meaning that you don't need a dedicated diary format to adhere to, or some specially printed book; any old exercise book can fit your needs! My goals and desired outcomes were simple - I wanted a way to record my day to day events, whilst not losing focus of tasks and things that needed to be done, be it professionally, or personally. I also wanted to be able to do this, no matter where I am, as long as I had sufficient visibility, the journal, and a pen. I didn't want to be beholden to battery power, or other nasty limitations. And as a plus, I really enjoy the tactile feeling of just, writing something. For any seriously longer-form journal entries, there is of course, this very blog that you're reading. Before I go into my rant about Bullet Journals, and how I do them, and such - here's the original site that I learnt about it from: https://bulletjournal.com -- It's kind of turned into some sort of online store/sales point - but the concepts are still visible and solid. There's also about a hundred thousand people who've made videos about Bullet Journaling on YouTube and various other social media. 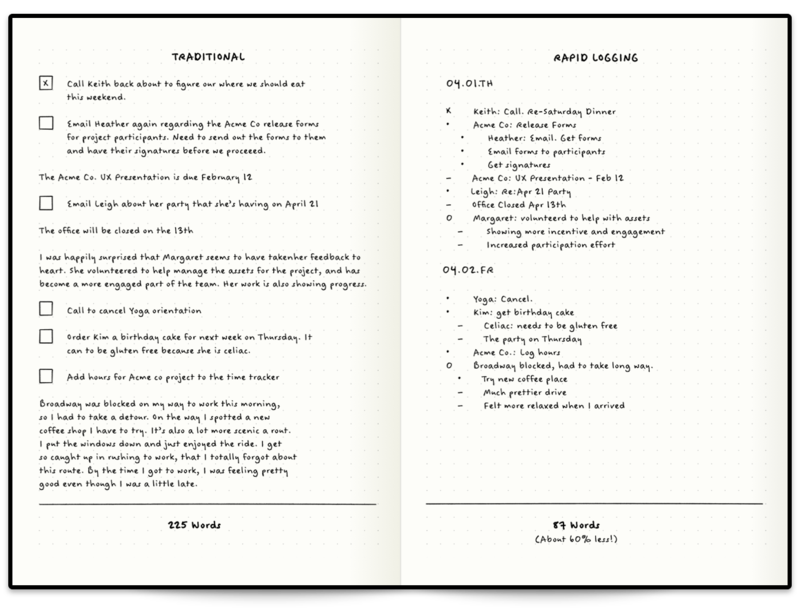 On the left, you see how someone might have a journal entry that's somewhat longer form, but quite typical of a diary. On the right - you have something a little more 'lean'. This is rapid blogging. You'll notice that there's different symbols for everything; and every bullet journal has their own symbols and guide (I'll go through mine later) - but for now, the default ones you see in the tutorial image above are split into several types. Yes. Emphatically, and simply, yes. It's a focused, habitual and easy way to keep track of things, remind yourself of your goals and ideas, and really take a breather in your busy day. Since this is my first bujo, and as reach the end of 2018 (and coincidentally, near the end of the book I use for it) - I thought I'd do a bit of a retrospective on the way I've used it, and things I've learnt. My first BuJo involved a fair number of mistakes; initially so bad that I ripped out the first 20 or so pages of the book! (yikes!) But after some planning, and with (not quite) enough forethought, I managed to eke out a usable solution. I tried a variety of different symbols, and worked on how detailed I should make my daily log entries (everything from weather, to BSL and daily spends) and by the final quarter of 2018, I finally came up with a simple box and circle bullet point system, with simple daily labelling to help. Anyway, moving on - as we go into 2019 - the new BuJo I've worked on setting up today is going to include a couple of features I've seen around that I'd like to try out - such as a year in pixels, based on the mood of the day, I can colour in a square in a grid, with a corresponding colour to mood - and at the end of the year I should have a fairly pragmatic overview of just how well things went that year.